Two people influenced my interest in lure making — Kelly Doolin, a farmer, trapper and dogman whom I lived with; and Coxy Lorenz, the local country fur buyer. Kelly came from the Tennessee Mountains and he used a lot of natural baits for an attractant: skunks, groundhogs, cats, muskrats, urine, etc. 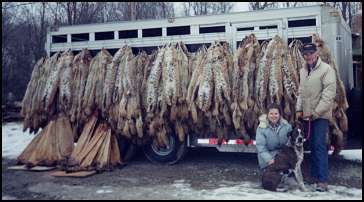 The biggest factor was a jar of skunk bags sitting on the shelf in Coxy's fur shed. I asked him what they were and what they were used for, not knowing anything about lure at that very young age. Coxy tried to explain how certain animals were attracted to the same animal odors and also attracted to other species of animal smells. Later, what really helped, was working for Coxy and him showing me firsthand where to find the different glands. Coxy was a trapper and a ginseng digger along with his fur buying, and he picked up knowledge from all the trappers from whom he bought fur. This information was shared with me and what stuck in my mind was about the fox and mink. Later, when I started dabbling in lure, this was very helpful. It takes a lot of trial, error and testing to make a good lure. It's very satisfying when you put different glands and scents together to come up with an odor that will catch the target animal you are after. I encourage any trapper to try his hand at it. These lures will catch in rough weather and under heavy trapping conditions. It takes a top quality lure and urine to deliver, and to produce fur. Conner's Lures are combined for maximum catches. This means extra fur, extra money. The lure I offer is the lure I use on my own trapline, and it has caught thousands of dollars worth of fur for me. A loud, very strong lure. Four or five drops are plenty at a set, or a good smear on a bush 10-15 feet from set. A very strong, long-reaching, powerful lure. Should be used directly at your cat sets. Use by itself or a combination of other lures. I feel it is one of the best lures ever put in a bottle. Aged glands blended with cat urine. Gives off a mild natural cat odor. Limited supply available. Contains glands, a blend of musks and other special ingredients, aged properly. One of the best curiosity lures you will find. An excellent sweet smelling curiosity lure for all types of predators. For year 'round use. A very heavy, thick lure with good age to give it a loud coyote smell. The shyest dog will work your set. A true, natural foxy smell loaded with fox glands, ground very fine for a long lasting fox odor. Also a thick bodied lure that will last. Greys will work your sets easily and without fear when using this lure.